Soft pillows of marshmallow surrounded by a crisp outer crust, meringue is simplicity at its sweetest – miraculously created out of nothing more than whipped egg whites and sugar. 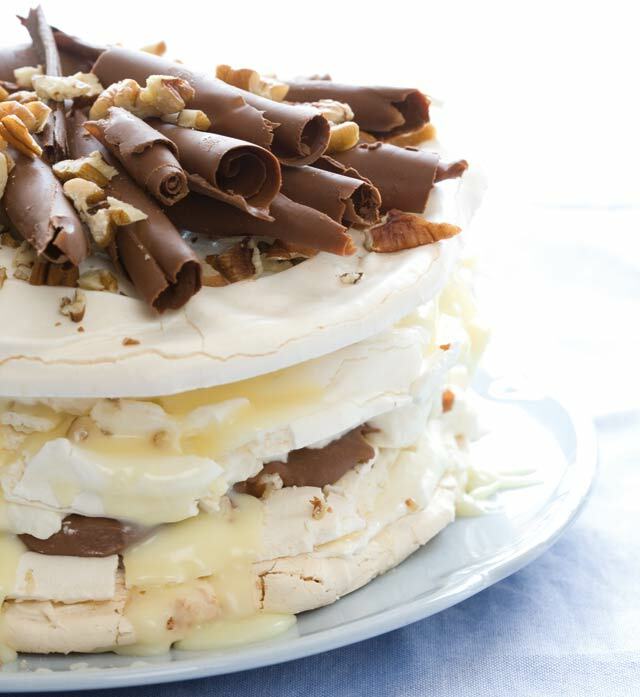 Try this delicious recipe which celebrates the magical meringue. Pipe or spread the meringue in 4 large discs and sprinkle with the chopped nuts. Preheat the oven to 120°C, turn the oven off, prop the door open slightly with a wooden spoon and let the cryo-watch meringue discs dry for at least 8 hours or overnight. Heat the cream and pour ½ cup over each of the chocolates and stir until melted. Allow to cool. Whip the cream with the liqueur. Spread the dark ganache on one disc and spread with whipped cream; follow with another disc, the milk chocolate, more whipped cream, another disc, the white chocolate, the final disc and then finish with more cream. Refrigerate for 3-4 hours before serving. Decorate with chocolate curls or drizzle with melted chocolate and top with more chopped nuts. Need the perfect, simple meringue recipe? We have the perfect one for you! Want to make your own chocolate shavings?